ZURICH, May 30, 2011 (AFP) - FIFA suspended executive committee members Mohamed bin Hammam and Jack Warner but cleared President Sepp Blatter of corruption on a dramatic day for football's world governing body. FIFA's ethics committee interviewed bin Hammam, Warner and Blatter on Sunday just hours after bin Hammam had pulled out of a bid to unseat Blatter in an election this week. 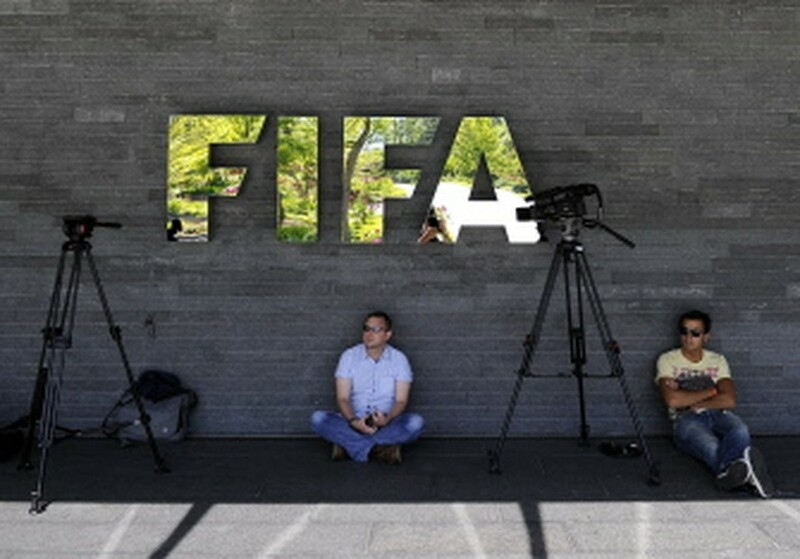 AFP - Media crew wait under a sign of the football's world governing body FIFA at its headquarters on May 29, 2011 in Zurich. Also suspended were Debbie Minguell and Jason Sylvester, both members of the Caribbean Football Union (CFU). They are alleged to have colluded with Qatari bin Hammam and Warner, of Trinidad and Tobago. And after the ethics committee chaired by Namibian Petrus Damaseb revealed its findings, FIFA secretary general Jerome Valcke said the presidential vote would go ahead as planned on Wednesday, with Blatter standing unopposed. "Both bin Hammam and Warner were provisionally banned from future activity in football while a full investigation is carried out," Damaseb announced. Both men would eventually be afforded "the opportunity to defend themselves", he added. "The FIFA Ethics Committee has reached its decisions," said Blatter in a statement. "I do not wish to comment in detail. But simply to say that I regret what has happened in the last few days and weeks. "FIFA's image has suffered a great deal as a result," added the 75-year-old Swiss. Warner hit back, alleging in a lengthy press release that Blatter had made a gift of $1 million to CONCACAF (the Central American confederation) "to spend as it deems fit." The inference was that there had been an attempt to buy CONCACAF votes for the Swiss. Asian Football Confederation president bin Hammam, 62, who was hugely influential in Qatar's surprise victory in the battle to host the 2022 World Cup, joined Warner in condemning the suspension. "I have been referred to the Ethics Committee based on evidence which was strong enough in the views of the FIFA General Secretary for such procedure," he said in a statement. "However, the Ethics Committee in its meeting today did not find this evidence sufficient to convict me. "Consequently, I should have been given the benefit of doubt but instead, I have been banned from all football activities." Hours earlier he had announced he was pulling out of the presidential race for the sake of FIFA's reputation. He questioned the independence of the ethics committee, suggesting that Valcke had had the real say. "This is not how I understand fair play," he added. Warner said his suspension "has come both as a shock and surprise to me", complaining that he had been given less than 24 hours to submit a statement for consideration by the committee. The complaints against him and bin Hammam were "politically motivated", he said. Bin Hammam, Warner and the two CFU officials, Minguell and Sylvester, were summoned to answer corruption allegations. The CFU pair failed to appear despite FIFA offering to fly them in. Bin Hammam and Warner were targeted after Chuck Blazer, general secretary of CONCACAF, reported possible misdeeds during a May 10 and 11 meeting in Trinidad. Bin Hammam and Warner were accused of offering $40,000 (28,000 euros) in cash gifts to national associations at the Trinidad conference in return for pro-bin Hammam votes in the presidential election. It was Bin Hammam who called for Blatter to be questioned by the ethics commitee, saying the FIFA boss "was informed of, but did not oppose" payments made to Caribbean officials. But the ethics committee accepted Blatter's version of events, said Damaseb. Blatter had said he had not been informed of what had occurred at the meeting, but that Warner had asked his advice ahead of it. Blatter replied that he should not hold such a meeting with the CFU. Damaseb judged that Blatter had not been obliged to report his encounter with Warner because no offence had at that time been committed. Despite the controversy, Valcke said there was no question of postponing the presidential election, which will see Blatter win his fourth and final term since he came to power in 1998. FIFA had embarked on a path of political change -- as per Blatter's last manifesto, Valcke said. This meant that "FIFA has never been stronger or as transparent as now," he added.